Well, I hit my 2nd trimester a little over a week ago. I’m now 14 1/2 weeks along. The pregnancy sickness is still with me but the worst of it is *knock wood* over. I still get stomach pain as my primary gut issue. I’ve also been eating like crazy, lots and lots of very fresh healthy food. So far I’ve gained 2 lbs from my pre-pregnancy weight. I carry big and have looked seriously pregnant for a long time. I look about 5 months now, not barely 3 months. But I’m far enough along that I love it. Aside from the obvious, that was my favorite thing about being pregnant last time: I actually look thinner. I’m an “apple” so I have a ton of excess weight in my gut but, when I’m pregnant, it blends with the baby bump and all looks like part of the same thing. I don’t look skinny or anything but I do look like I’ve dropped a couple of dress sizes. I chose a midwife and have seen her twice now as we plan for a home birth. The only negative is she isn’t very scent-free, though she’s been trying. I can’t be in her house at all because of new carpet and fragrances. Fortunately, she lives in the same town as me and is willing to do the visits at my house, which I greatly appreciate. 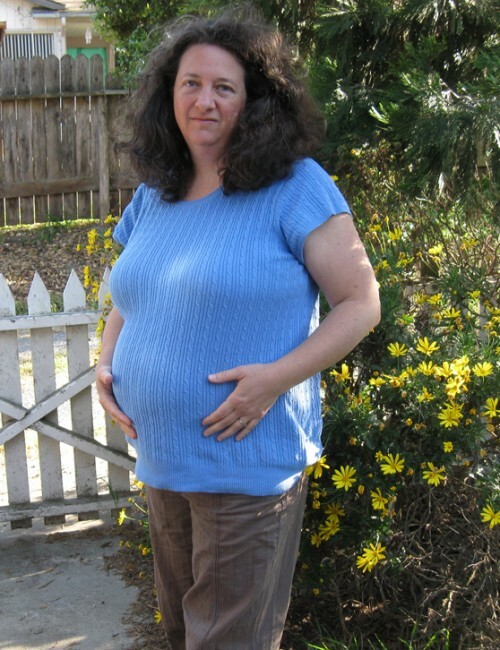 She was here at 11 weeks and used the Doppler to try to hear the baby’s heartbeat and no luck. But she heard “placental circulation” which was good enough for me. Plus a couple days before that I saw my MD who did a quickie internal exam and said my uterus was big like it should be. When the midwife was here last week (normally early visits are a month apart but we started late and she wanted to give me a chance early on to hear the heart) we did the Doppler again and got a heartbeat, which was really cool, though not a surprise 🙂 I got Michael on speaker phone and he was able to hear it too. My uterus is measuring big (as it did a couple weeks ago). About a centimeter higher than it “should” be. With my last pregnancy I was carrying so big I was sure I must have twins but my uterus measurements were always dead on. This time I’m even bigger (despite weighing slightly less) and my uterus is actually “too big.” Coupled with the higher than average HCG doubling blood tests, the midwife confirmed my suspicion that this means an increased chance for twins. I really had to push her though because she didn’t want to quantify it. Finally I said, okay is my chance of having twins 25%, 50%, or 75%? She said 25%. So far everything looks good. I have a lot of sudden-onset bouts of tiredness, as well as milder longer ones, and haven’t been able to exercise for a while, but overall I’m decent (you know, the usual stuff). My lower back and hips have been hating me for a while now and I have to be careful how I sleep. I can’t be on my stomach anymore (I don’t sleep like that; I mean for anything) and being on my back is starting to get unpleasant (not from cutting off circulation, just uncomfortable). Wish I could get weekly bodywork. Miriam has just been thrilled and talks to the baby (“does it have ears yet?”) and kisses my belly regularly. At 11 weeks, the midwife gave her a plastic doll that is the size and proportions of a 12 week fetus. She played with it, pretending to carry it in her tummy. I told her a bit what birth was like (contractions then pushing the baby out) and she loves to emulate the experience. I explained that the pushing was kind of like a difficult poop. Michael chimed in with “but the poop is THIS BIG” and oh did Miriam’s eyes get wide. She’s now decided she wants to be a midwife and she is going to deliver the baby herself (“me and you mommy”). Though she agrees the actual midwife can be there too. Michael said, you know, when the baby comes out it’s covered in blood and goo and stuff. Miriam answered “that’s okay, I’ll wear short sleeves.” She’s also requested birth videos. The ones the midwife lent us either didn’t show the birth (personal DVD) or were scratched. So we’ll be looking around (can’t do online video well on this computer). Many blessings and much love headed your way!